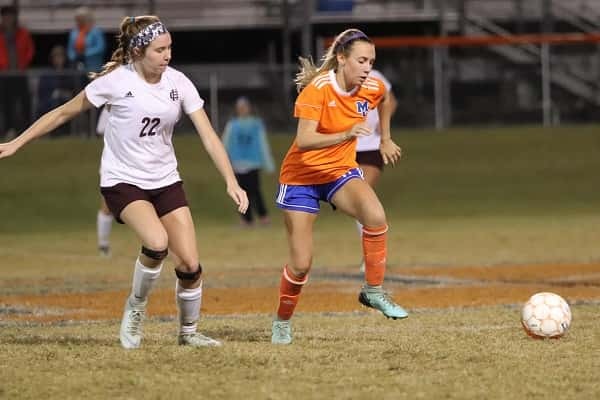 Loralei Samson (10) and Kat Howard (8) double up on Henderson County leading scorer and Murray State-bound Maddie Griggs in Monday’s first round of the girl’s state soccer tournament. 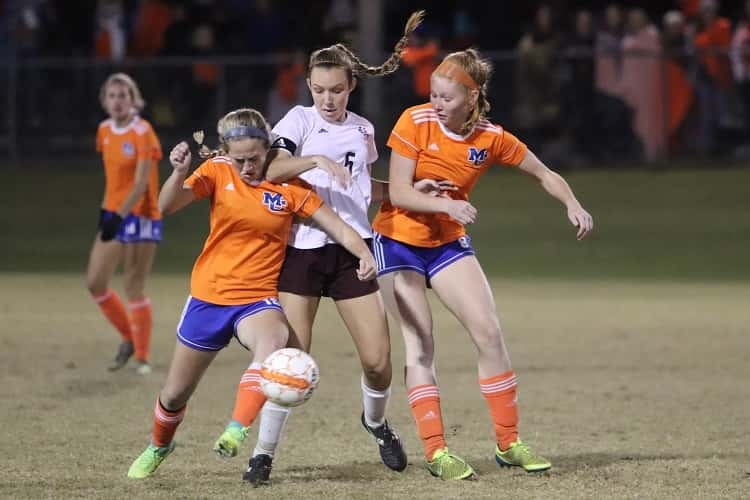 An epic battle…everything a first round semi-state game should be, is exactly what transpired for 80 minutes, plus two five-minute golden goal overtime periods and a round of penalty kicks to decide who moves on to the round of eight in the KHSAA Girl’s State Soccer Tournament. Handing #8 ranked Henderson County their first shut out in regulation since September of 2017, the game went into two golden goal five-minute overtime periods and still scoreless, went to penalty kicks. Still tied at 2-2 after the first round of PK’s, Lady Colonel keeper Ashby Greenwell made the save in the sudden-victory round, then Abbey Roberts found the net for the win. 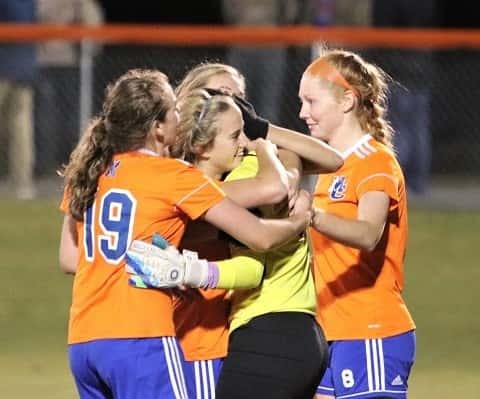 Marshall County players surround goal keeper Carlen Whirley at the conclusion of the Lady Marshals loss in overtime and penalty kicks. For the second straight year, the Lady Marshals season has ended in a first round semi-state overtime game, last season to Daviess County. The Lady Marshals defense held future Murray State player Maddie Griggs scoreless in regulation. Griggs had 57 goals coming into Monday’s game. Carlen Whirley made several great saves in regulation as well as in overtime. 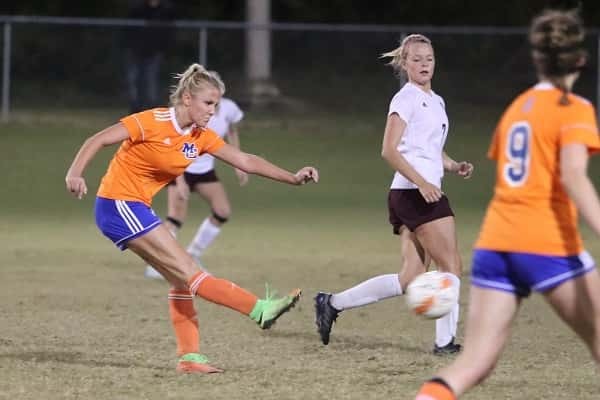 Whitley Watwood and Carmen Gunn scored the Lady Marshals two PK’s in the shoot out. 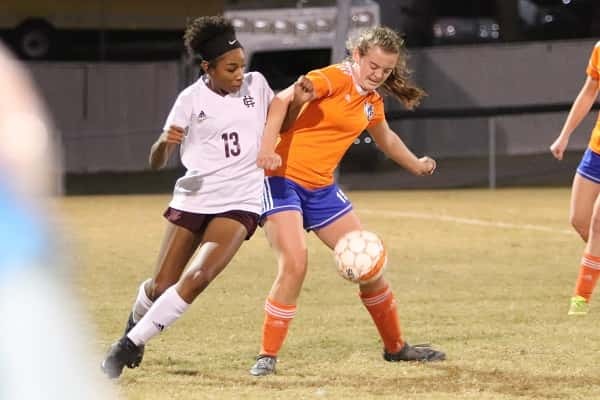 Griggs and Cecilia Palummo had the two for Henderson County in the first round, before the winning PK was booted in by Roberts. With just two losses this season, the Lady Colonels move on to play Bethlehem, a 6-5 winner over Bullitt East. Of the eight semi-state games on Monday, one other was decided in overtime and penalty kicks in which Greenwood defeated Owensboro Catholic 2-1 in that game. The Lady Marshals finish the 2018 season with a record of 14-8. Lindy King dribbling past Henderson County’s Caitlyn Honeycutt in Monday’s semi-state game at Colburn Stadium. Whitley Watwood’s defensive effort kept the ball from the touch of Henderson County’s Abbey Roberts (13). Kylee Crass gets off a shot against the Lady Colonels, but neither team would find the net in the 80 minutes of regulation.